I started playing football when I was 16 years old for the Prague Lions and that is when I first met, Zach Harrod (coach with the Prague Lions). When I started playing my position coach (defensive backs) was Zach, sadly I only had one season with before he went to the states for two years, but upon his return, in 2007, he helped us win the Czech National Championship! Micah (another coach and board member with IF) and Zach want football to improve here, not only in with our team, but in all of Czech. They really desire to help the sport grow, so that more teams can have great coaches, more great coaches like them! They have brought to much to our team, one of the things they have brought is F.A.M.I.L.Y. to our team. Our team is so much more than you think, we really are working as brothers on and off the field. Sometimes I stop and wonder how my life would be without these coaches, and honestly I can’t even begin to imagine! My life has been changed by their presence and through LIONS FOOTBALL. Football helped me have direction, it gave me life goals, before I never thought about doing something more with my life. It helped me learn how to set these goals, envision this goals and what I need to do to see them come into fruition! These two have also changed everything with football here in the Czech Republic, they have brought innovation and energy! They brought spread offense, zone blocking, clear thought out defensive strategy, better ways to practice more efficiently and safer! But also they have brought heart and caring to the game, in ways that many people don’t understand, which is so much more than their skills, speed and etc. Their desire to see their players be great students and successful people in all of life – people who want to help each other and everyone around them! In reality, the Lions are changing more lives than anybody really knows! Most people think that football is just a sport, but it is so much more than a sport! We live for football. It’s our way to strive for “perfection!” I know guys on our team that lacked any form of self-confidence and they are completely different now! We know that if we want to strive for this “perfection,” for something more we have to sacrifice, football has taught us self-sacrifice! We have the best junior program and I take so much satisfaction from knowing that our players are not home playing vide games or out drinking or doing drugs! They play the best sport on this planet – American football – and they are learning how do to it and life right thanks to the Prague Lions! I hope you think this is great and it’s worth it! If you do, please support our team, the Prague Lions and also Interception Foundation to continue to improve football and life here in Prague, Czech and Europe! Choosing to play for the LIONS was so far the best thing that happened in my life. 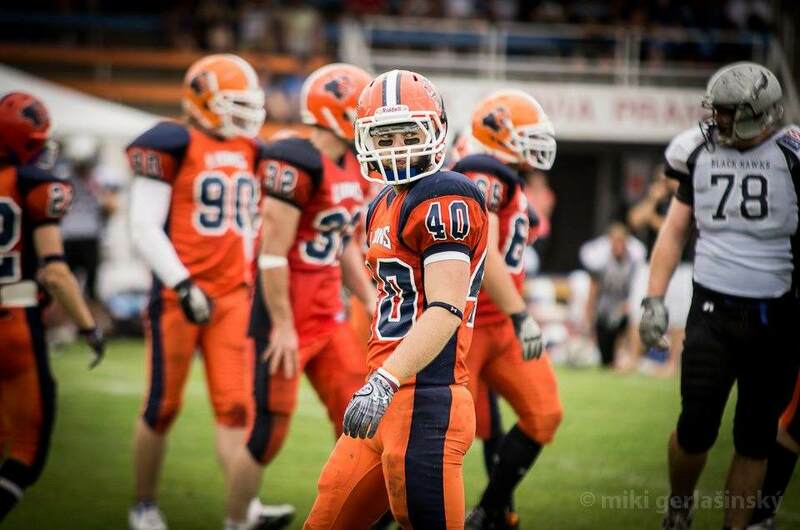 Over a year ago I choose to try a practice with the Prague Lions and since then football has been my life. Before that I played ice hockey, baseball and soccer and never was I part of such a close-knit family of brothers. Our coaches always try to make everyone part of the family, no differences between the players that play in the team for years and all the new kids. Everyone is included. It is an unusual sight here in the Czech Republic. Our head coach, a coach associated with IF, spends all his free time doing something for the team, it might be doing schedules for practice or a gameplan of some sorts, so that I know that on paper the team is ready to dominate. Then it is up to us, the players, to make use of what we learned and pour out our hearts on the field. If we do our part we can’t lose. The coaches also always try to make our performances better, they spend time with us in the weight room, make extra conditioning practices or spend time editing game tapes for us. This sport has changed my life, it is not just that every practice I try to become a better player but our coaches also try to influence us off the field too, they try to shape me into a better person. I hope our coaches will be a part of my life in the future and help me achieve my biggest dream, which is studying in the US. Ever since I was little I always wanted to experience and have that feeling of being part of a team. I knew what it was like to have friends outside school and from my neighborhood, but I never felt part of something bigger. I tried many sports but they never met my expectations. Then I saw some films about American football and I thought it was amazing. I asked my friends what they thought and they thought that I should give American football a try, even though I might have been just another little, skinny guy. One of my classmates wanted to play American football as well, so we decided to look for teams. It was obvious from the beginning it was clear what team we should choose – only the PRAGUE LIONS! As I look at things today I must say I am very happy with my decision. However is wasn’t always easy for me during my first season. If it wasn’t for our head coach, a coach associated with IF, I might not have continued playing because it was difficult at the beginning. But since then I have decided that I want to be the best LINEBACKER! My HC was a key part of my support through the season, as after many practices he would tell me to hang in there and that I could improve after practice, every day! I can say he is the best coach I’ve ever met and I owe him a lot for continuing with football and learning to love this sport. Because of this I really didn’t want to disappoint him, or my teammates. In my first season, I didn’t see everything I wanted to in, but it had given me more motivation to pay the price to do everything I can to improve in my second season! I was that to be as the best linebacker for the Lions Junior team and help lead the LIONS to another championship. I want to know next year that I deserve the medal that will be around my neck after next season. I am proud to wear my team's jersey!